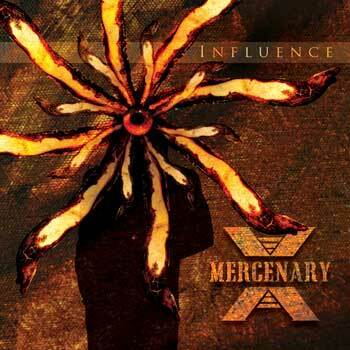 Houston Music Reviews : Mercenary X "Influence"
The original core of the band consists of Chris Shields on lead guitar, Rus Gib on vocals, and Andrew Sutton on bass. "Influence" is the first LP by the band, with some songs on it being a rework from their previous demo. Being familiar with "Destroyer", "Darkness Descending", "Wheels of Corruption" and "Payin' the Price" from their earlier demo and live shows, I can definitely appreciate the crisp production and the added extra dimension that Jeff brings to the table, especially in terms of orchestration. From this LP it is obvious that Mercenary X is a well tuned machine - these guys have honed their stage skills and know how to work with each other. Rus Gib has one of the best melodic male voices in Houston and he makes great use of it on this LP, as the harmonies and melodies are relentless. Chris Shields is solid on rhythm guitar and provides some intricate lead work which meshes well with Jeff Nordin's lead keyboard lines as they trade leads. Jeff wears two hats on this album, as he is also the band's drummer (he plays both keys and drums live as well) and honestly I can't say which one he does better, as he covers both quite proficiently. The bass work of Andrew Sutton is solid and provides some very interesting counterpoint ideas, that particularly stood out during the guitar solos in a way that reminded me of Steve Harris' work in Maiden. "Spirit Cartography" - a clean piano/vocal ballad on which Andrew plays upright bass completely took me by surprise as I didn't expect the guys to go to such mellow territory and pull it off so effortlessly. Honestly, can't think of any other Houston metal band that can pull this off and do it so well. This song blends well into the next piece, "Abaddon" which hits hard with some really thick intro orchestration. Honestly, I can't find fault with any of the songs on this release as they are multi-dimensional in such a way that the longer you listen something new comes out. I felt that the keyboard patches were a bit overindulgent in a few places, which took out some of the underlying heaviness of the rhythm. People that know me are aware that I tend to be a little keyboard-phobic so it could be that as well. The cymbal mix might've been brighter in the mix that I would've preferred, but these are small issues on an otherwise great LP. In terms of production - this album sounds honest as most of the 70s/80s rock and metal does before more recent studio trickery. It is refreshing to hear such a well captured performance, especially in the metal genre, where thanks to a few signature producers the drum kit is triggered and everything is squashed to death in post production. Overall, great release by an awesome band - Mercenary X is definitely worth watching out for as they are going places! Make sure to check them out at their CD release party on March 24, 2012 at Acadia.